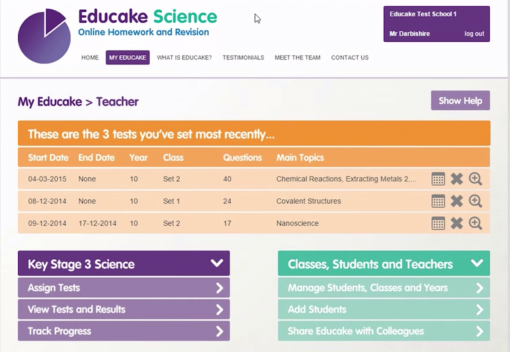 Educake’s online interface makes it easy for teachers to set up quizzes. UK startup Educake promises an easy-to-use online solution for teachers to set up and grade quizzes and students to provide answers, much of it automated. The traditional publishing processes, he felt, were “just mind-bogglingly backward” in dealing with digital with the endless roundabout of copy between writer, editor and copyeditor – and yet all the time all they were trying to do is explain concepts such as photosynthesis clearly. “Publishing staff basically just wanted to work with books, so weren’t the naturally entrepreneurial types who would take risks and find out new ways of working. It was a really different approach that was needed – one that was really focused on user experience. When teachers sign up for Educake they can chose from more than 6,000 carefully written questions, matching their school’s specification and the UK’s new KS3 curriculum exactly. It takes less than a minute for the teacher to set an exercise for a class, and even though it is not multiple choice, it is marked automatically by form of artificial intelligence called a fuzzy algorithm that matches small phrases to the answer, with – according to Darbishire – an error rate of only two in 1,000 (which he thinks is still too high). Students can log in to their account and answer questions when and where they like, on whatever device they have, getting the kind of instant feedback that makes social media so addictive. As well as monitoring their pupils, teachers can use the same results to evaluate their own performance and work out where they need to improve. For Darbishire, the key to delivering the kind of digital platform he wanted was to pay writers a fixed fee to write high-quality content that Educake then owns outright. This content, which the writer has nothing more to do with, is then broken down into small, easily manipulated pieces to form a content bank, and only reassembled when it is needed to match the specifications of each exam. “Then, just as Google reinvented the search engine by coming up with a user interface that allowed people to easily find what they wanted, we needed a high-quality user interface, as teachers are constantly telling me that they bought this or that package which they haven’t really used because it doesn’t work and is not enjoyable. 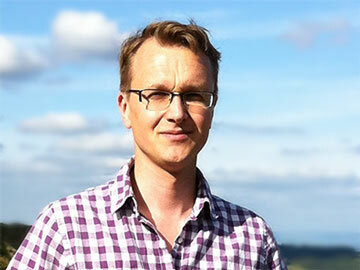 “Finally, Educake support has to be brilliant to give them confidence in the product. They can email in and we will endeavor to answer in ten minutes. We then use their feedback to alter our product quickly – not quite with a flick of switch – which is something that a traditional publisher with all its committees can only dream of. “However, only in September did we decide to focus on sales. Up to then we had focused on getting the product right, as the product has to sell itself since we don’t have a huge sales team like publishers and have to work hard to get responses from a few thousand heads of science without spending a lot of money. So despite the technology that Charley Darbishire and his team at Educake have developed it may well just come down to how much shoe leather they are willing to expend to reach a few thousand decision makers that in the end seals their fate.